Stumpy’s Hatchet House, a franchise based in NJ, is coming to 816 Dickinson Ave this Summer. 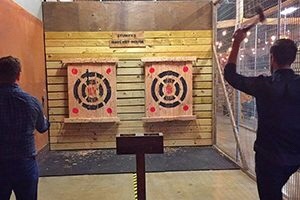 Customers (21+) take turns throwing hatchets at wooden targets in controlled “throwing pits.” The owners of Ford and Shep are bringing Stumpy’s to the area. See links below for more info.